6 September 2016. A microfluidic, or lab-on-a-chip, device speeds the analysis of individual cells, which its developers show can be applied immediately to testing antibiotics. A team from Massachusetts Institute of Technology, Harvard University, and affiliated institutes describe the device in yesterday’s issue of the journal Nature Biotechnology (paid subscription required). The lab of MIT engineering professor Scott Manalis that led the project reported on new capabilities of its suspended microchannel resonator technology, which detects and analyzes actions of individual cells. Suspended microchannel resonators are microfluidic devices that measure the mass of individual cells with ultra-fine precision by their vibrations as they flow through tiny channels etched into a miniaturized chip. The device also can measure the density of mass in a cell through displacement of fluid in the channel. Up to now, suspended microchannel resonator, or SMR, devices measured one cell at a time, which while useful for academic lab research is too slow for real-life diagnostics. In their new device, the researchers array 10 to 12 SMR sensors on a single chip, about the size of a postage-stamp, with enough space between the sensors for the cells to resume their growth before encountering the next sensor. The channels on the device can measure and record the mass of 2 cells simultaneously, increasing the device’s capacity. The team tested the new SMR device with E. coli bacteria encountering two types of antibiotics. The first antibiotic, kanamycin, is given for short-term treatments that works by blocking synthesis of proteins and thus stopping the growth of bacteria. 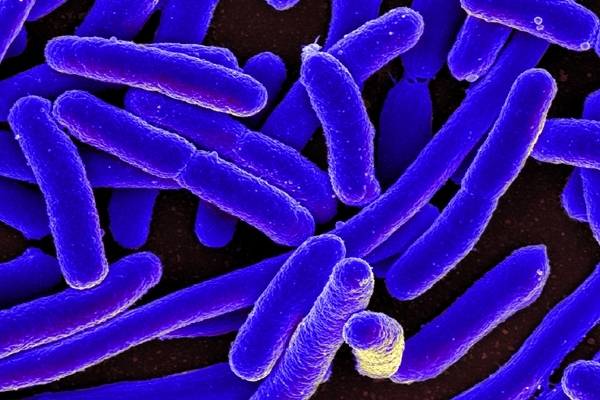 The authors report the new device reported results of kanamycin on E. coli bacteria in about an hour, while an earlier SMR would have taken about a day. In another test, researchers evaluated the device with CM15, a biologic antibiotic candidate. CM15 is based on peptides that make tiny holes in cell walls, causing the contents to leak out and in time killing the cell. Results from the new SMR device show E. coli bacteria in the presence of CM15 losing mass almost immediately. The authors note that the size of cells did not change, suggesting that the effects of CM15 treatments would not be detected with conventional microscopes. Members of the research team are working with Dana Farber Cancer Institute to apply this technique to measuring the mass of tumor cells interacting with cancer drugs. MIT filed a patent application for the technology described in the paper. Manalis is a co-founder of Affinity Biosensors, a company in Santa Barbara, California, offering high-speed cell measurement devices.